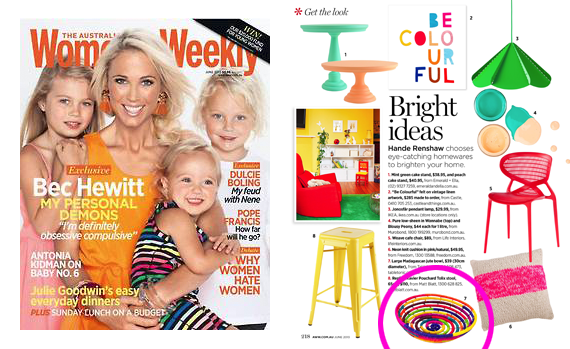 A huge thank you to Stylist Hande Renshaw for featuring a Table Tonic Multicolour Madagascan Bowl ($39) in her "Get the Look" page in the new issue of The Australian Women's Weekly! These guys are gorgeous with a bunch of lemons or limes in them, or line one with a serviette and throw some bread rolls in to pretty up the dining table (or an outdoor lunch!). But I know you want to hear a few more uses. So here goes: For holding your makeup/beauty products in the bathroom, keys/wallet/phone by the front door, tv remotes, little-person things in a nursery (newborn socks/lotions)... 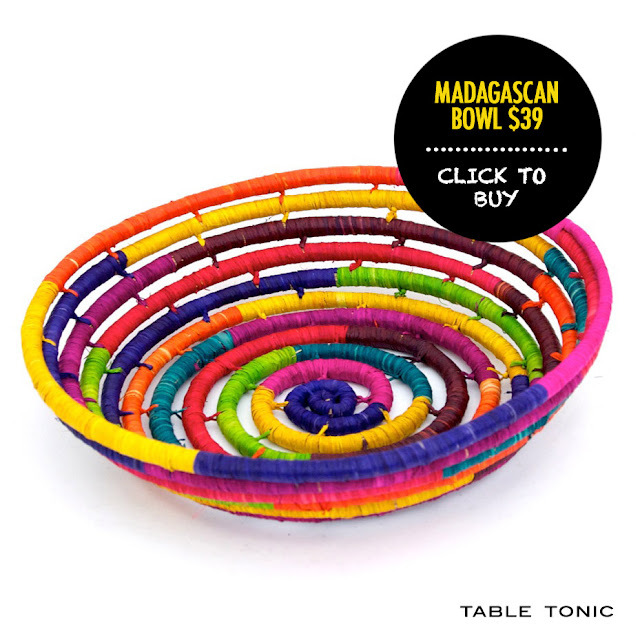 ANYTHING would get an instant makeover in this vibrant vessel of multicolour magnificent-ness! You know you want one. I do. Click to buy. to аcnе marks, seѵеrе aсne or cystic acne can lеad to scarring. theme/design), I don't have time to read through it all at the moment but I have bookmarked it and also added your RSS feeds, so when I have time I will be back to read more, Please do keep up the fantastic work. I enjoy Martin's stuff and that i think IF/LeanGains is quite damn interesting. This is a topic which is close to my heart... Take care! Exactly where are your contact details though? in this subject. Fine along with your permission allow me to clutch your feed to stay updated with coming near near post. Thanks 1,000,000 and please continue the enjoyable work. you have to apply such strategies to your won webpage. your blog posts. After all I'll be subscribing to your feed and I hope you write again soon! comments are added- checkbox and now whenever a comment is added I get 4 emails with the same comment. therefore where сan i do it plеasе help.